The new military film “Act of Valor” used real life Navy Seals to give Americans a “realistic” view of what these secretive forces do. But is it reality, or just what the U.S. government wants you to see? The mainstream media has mostly ignored how the Pentagon doctors Hollywood scripts in order to shift public opinion. This cozy and powerful relationship, has been winning hearts and minds for decades. In the new movie “Act of Valor,” you will some of the world’s most elite warriors, outfitted with the most technologically advanced equipment, and plenty of fire power. In the end, the American hero comes out on top, but there is something missing from Hollywood’s supposed realistic portrayal of the U.S. military. “That stuff looks fun but soldiers today who are joining the military, the number one thing they’re going to be doing is walking around on a foot patrol in a big circle every day, day after day and suddenly a bomb is going to go off on the road, blow up one of their friends, blow up one of their vehicles,” said Michael Prysner, an Iraq War Veteran. In “Act of Valor,” there are definite reinforcements of the Muslim, terrorist, bogey man. What the film does not show is the damaging effect of war on U.S. troops. Also missing is action on the battlefield, better described as war crimes, than valor. 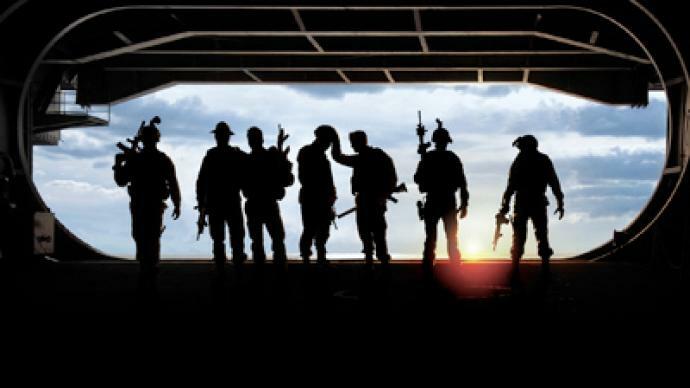 Many military films such as “Act of Valor” aren’t born in Hollywood, but in the Pentagon. While these movies may be a success at the box office, the true measure of success is not just measured in dollars, but in the number of recruits it can bring into the service. “This film was made with the backing from the military for a reason. It exposes the future generation of seal operators to our community and how we operate,” said Navy Seal Capt. Duncan Smith. Hollywood and the Pentagon have teamed up to create entertaining propaganda since the early 20th century, but the partnership really took flight after the success of Top Gun. Now many more filmmakers are getting access to tax payer funded, military equipment, if the message lines up with the Pentagon’s mission. “What has ultimately has happened is that Hollywood studios have told screenwriters, If you’re screenplay cannot get the acceptance of the Pentagon, then we financially are not in a place to make your movie,” said author, David Sirota. Besides shaping the narrative of how we perceive war, some are concerned that movies like these are specifically targeting America’s poor youth. “If you look at how this movie Act of Valor came about, Special operations commander Mc Raven straight up told people that the movie began as an effort to recruit minorities into the Seal Teams,” said Derrick Crowe, Political Director at Brave New Foundation. “Obviously you’re not there to teach people about the hardships of war, or the bad consequences of war, or the things they’ll have to live with,” Crowe added. Act of Valor has all the makings of a Hollywood blockbuster, complete with some high flying promotion by the Navy Seals who dropped in on the red carpet premier. “We ended up being able to shoot the action the way you would watch a football game on TV,” said Executive Producer Max Leitman. But military battles are no game to veterans who have seen the ugly face of war. “They are plagued with psychological trauma for the rest of your lives and the reality was they didn’t go over to do anything heroic, but with their role as an occupier, they feel this guilt, and its what’s caused this epidemic of suicides in the military,” said Prysner. For a bit of cash, and ready access to real military hardware, Hollywood is more than willing to provide a happy ending for both the movie’s hero and the Pentagon.